Has it become too commonplace to lie to children, and then excuse it as acceptable behavior because “it’s no different than Santa Claus”? 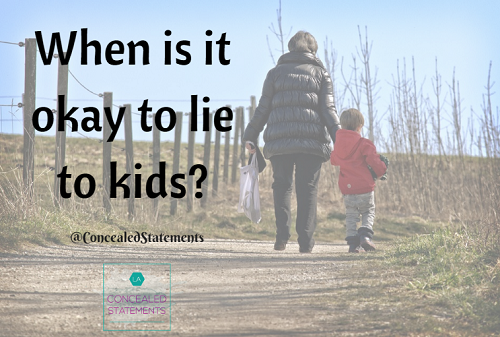 We can all agree there are times when it is in the best interest to lie to a child. However, we are not all in agreement under what circumstances is acceptable. Can you think of any other times? I believe those four general areas sum up when lying to kids is acceptable. Deception and lying seem to be at an all-time high in our society, with politicians exemplifying this poor example. Do we really need to perpetuate it by telling unnecessary lies to children? I recently saw a graphic that encouraged adults to tell kids that their ears turn red when they lie. So in the future when they lie, they would cover their ears. I seriously thought it was a veiled attempt at humor. It’s difficult to tell the intended tone sometimes with digital communication. I felt compelled to respond that lying to kids about lying ranked right up there with spanking a child while telling them that “it’s not nice to hit people.” If it was humor I thought that would not be coming on too strong, but also made my point in case it was a serious suggestion. Boy, did I get an earful in return. You would have thought I’m the only person on the planet who is of that mindset. I had a grandma and nanny tell me it was perfectly acceptable to lie to kids about their lying because it was no different than telling them Santa Claus exists. She wrote much more to defend her position, but I wasn’t about to get into an online debate, so I decided to exit stage left. What are your thoughts lying to kids?